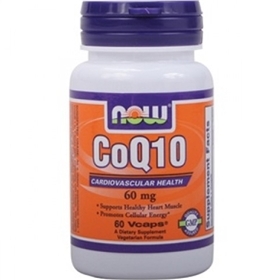 The National Cancer Institute stated the body can use CoQ10 to protect cells from damage that might lead to cancer. Animal studies have shown it helps the immune system work better and helps the body resist infections and certain cancers, according to the institute, which also points out studies in breast cancer patients have resulted in patients improving with CoQ10 treatment. Researchers at the University of Western Australia in Perth found that CoQ10 improved blood pressure when used by people with type 2 diabetes. The study, published in the November 2002 issue of the "European Journal of Clinical Nutrition" tested 74 subjects and showed it also helped control blood glucose levels. Suggested Usage: As a dietary supplement, take 1 Vcap® 1 to 2 times daily, preferably with meals. We highly recommend taking this product with a source of essential fatty acids such as NOW® Flax Oil, Evening Primrose Oil, Borage Oil or Omega-3 Fish Oil. NOW® CoQ10 is Pharmaceutical Grade (USP). NOW uses only the 100% natural, all-trans form of CoQ10 produced by fermentation.